Team Raleigh’s Dan Fleeman has set the interview up for us, and we’re sitting in the “Hotel Anonymous” in Walsall. A dapper, trim figure in blazer and slacks bounds up the stairs; it takes a moment to register – it’s our man, Grant Thomas. Good words for riders from Viktor? They’re thin on the ground… Niko Eeckhout, Guy Smet, Hamish Haynes, Jack Bauer and maybe Jens Keukeleire get grudging acknowledgement. But there has to be someone he idolised, surely? 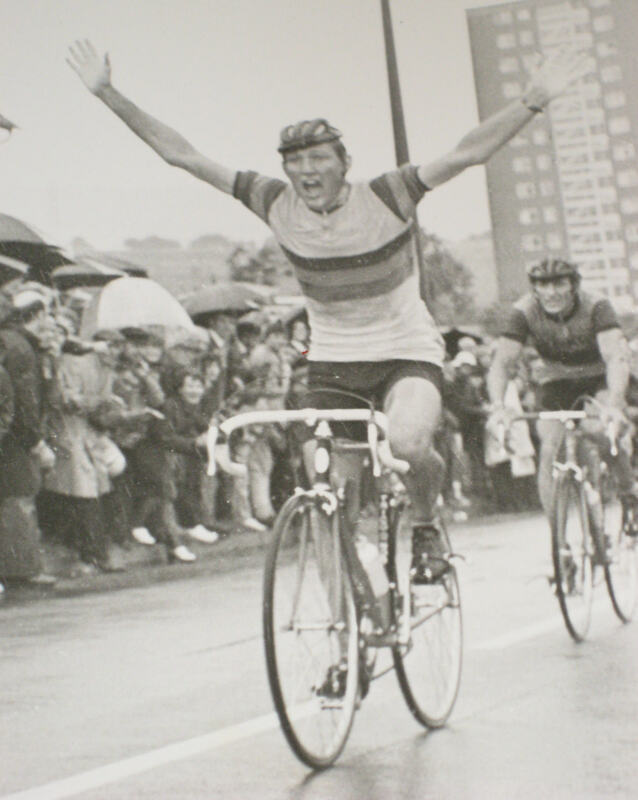 British amateur road race champion, winner of amateur Six Days and one of the best road men in Europe in the early 70’s. There were no budget airlines, no internet, no mobile phones – just the will to go and race against the best in the world. Grant brought some old newspapers and press cuttings along to show us. Grant was involved in the local brass band as a lad, it was part of the culture that each mine would have it’s own band, but music wasn’t what inspired the youngster. “My dad saved cigarette cards and I remember looking through them and being fascinated by the racing cyclist ones“, but that’s only a part of why Grant wanted to become a racing cyclist himself. 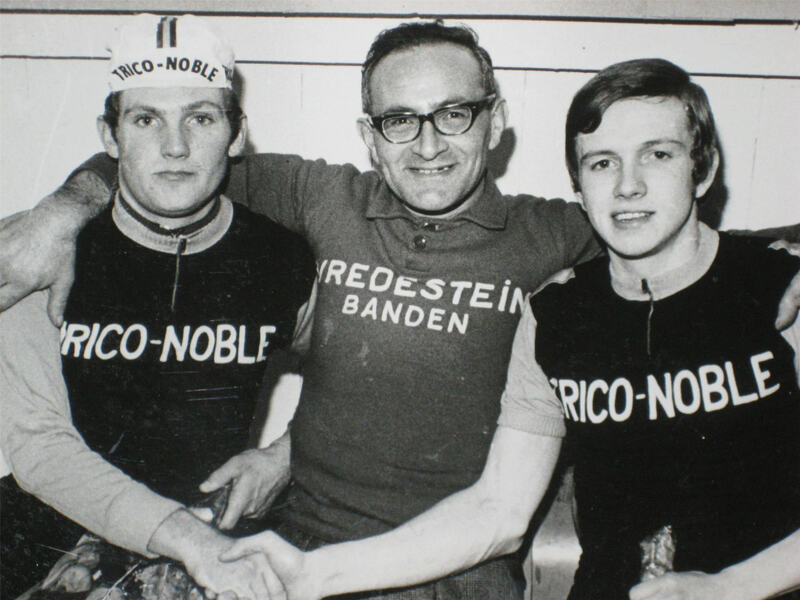 In the late ’60’s, the top track riders of the day were Ian Hallam, Ron Keeble, Harry Jackson and Billy Whiteside, and Grant found himself in the team pursuit squad with them. Grant and Bennet fixed up to stay with the family that evening, and that was it, they were organised. It was a culture shock as could be expected – not only living in a foreign country, but stepping up a level in the quality of the racing too. 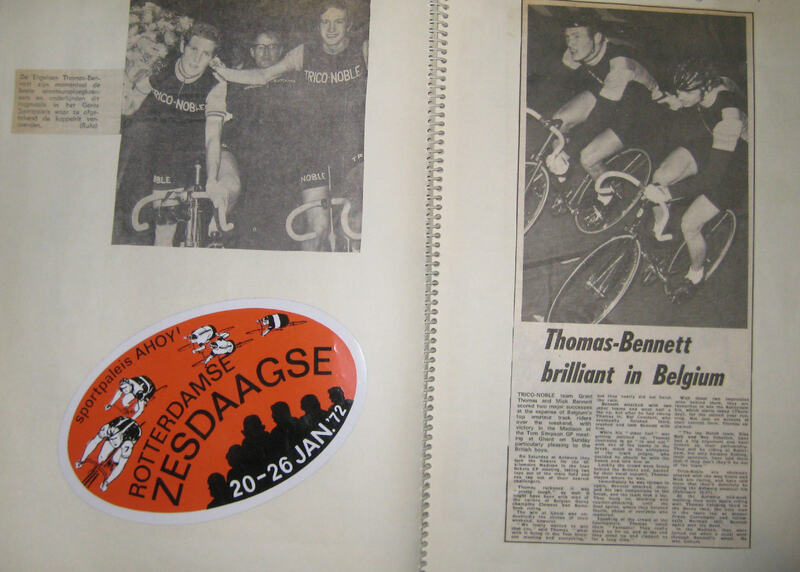 A very youthful looking Thomas and Bennet with their Six Day soigneur. On the track Grant was a stayer, but he had an effective sprint on the road. Towards the end of the racing season, Grant decided to remain in Holland, rather than come back to England. Once the crop was processed for the day, the two of them would go out training. Sometimes, Grant would buy a train ticket and travel up to the Antwerp track for a session on the boards. 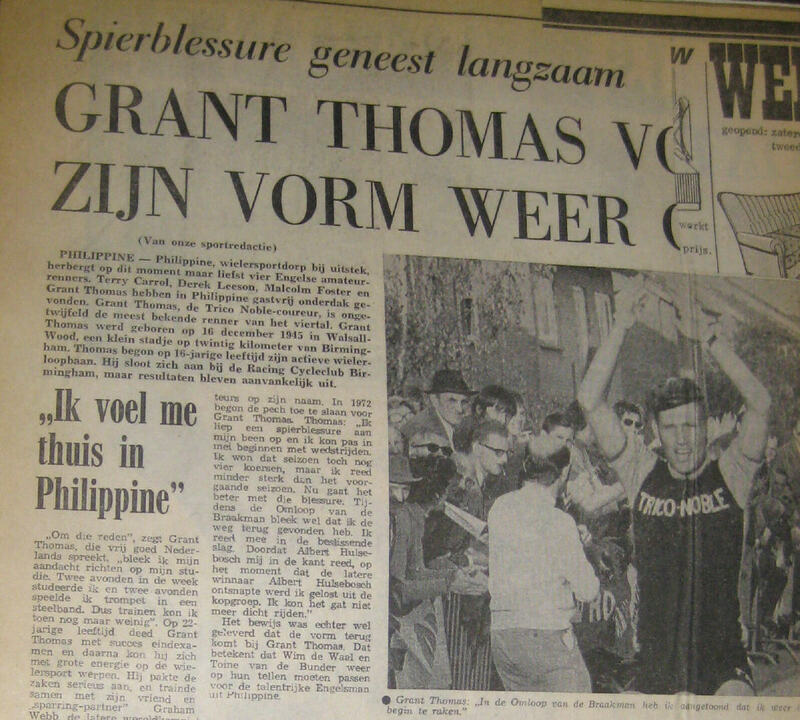 It wasn’t just the Belgian journalists that loved Grant. 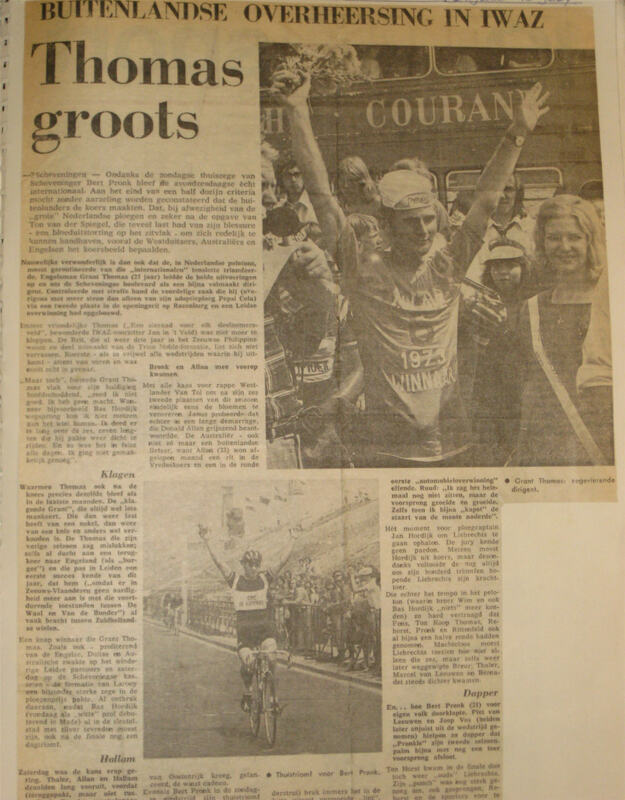 The local paper does a piece on the English lads, following Grant’s win in the Omloop van der Braakman. 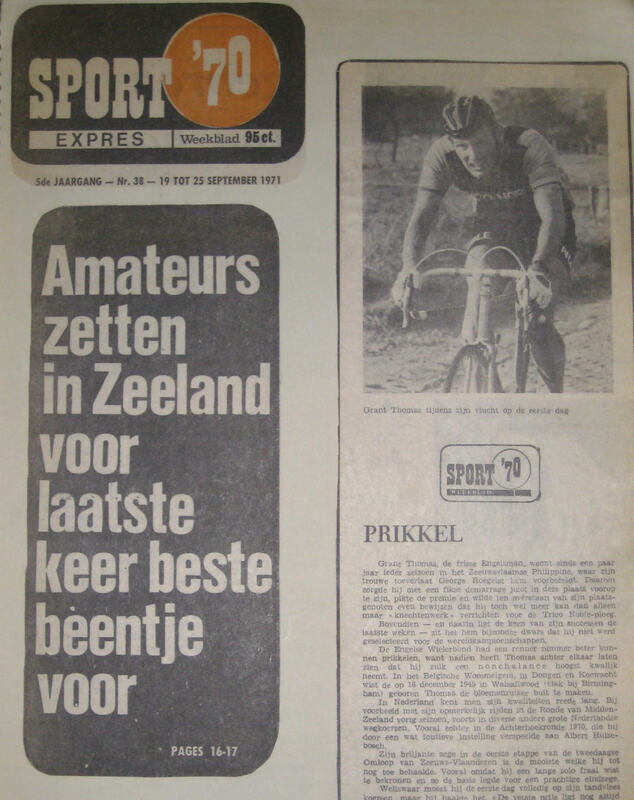 Sport Expres run a background piece on Grant in 1971. Grant tried to defend his title in the classic that he’d won for Trico the previous year but crashed whilst in the echelon and couldn’t get back on. Another win, another interview in the paper – this time at Sheveningen. Grant Thomas – British Champion. Despite never having taken out a professional licence in Holland, Grant turned pro for Falcon in 1979, but found it hard to get motivated for the events, such as 90 mile road races when there were only 18 or 20 other riders on the start line. A sturdy looking fella in his youth, was Grant. His voice tails off and it’s time for us to go, but it was a privilege to spend an afternoon in the company of a man who went out and did what the others just dreamed about. Thanks to Grant for his time, and thanks to Dan for arranging it. Previous articleDan Patten’s Blog – Back in the Game! Thor is staring down the barrel of a very tough day in the saddle today! He has been fantastic in first gaining the yellow jersey on the back of a great stage one sprint followed by his huge TTT effort, and then holding it with his epic rides up the Mur de Bretagne and Super-Besse. Can He Hold ?